Action Wildlife Removal in Orangeville, is your complete wildlife removal and management company. We have extensive experience in removing and controlling wildlife animals to protect your home or building. Our experts manage all animal issues based on the latest scientific methods available. Our wildlife technicians will help you with your critters such as raccoon removal or squirrel removal needs in Orangeville. We are committed not only removing the unwanted guests from your premises, but also take care of the required damage repair such as, attic insulation replacement, roof repair, soffit repair and more. Action Wildlife Removal aims to safeguard your family and pets from germs and bacteria that come from the feces that the animals leave behind. That’s why, we safely clean up any animal urine, droppings, or nests in your home or business. With us, you can rest assured, you will get safe, efficient and reliable wildlife management solutions. Our professionals are trained, insured and experienced. They strive to provide top-notch solutions in a timely and efficient manner. We are adept at removing a wide range of nuisance animals from returning to your home or business. Our round the clock services are designed to eliminate your animal issues as soon as possible. Our latest tools and techniques allow us to perform our wildlife management jobs efficiently for durable results. We use only environment-friendly products for wildlife removal and control jobs. Action Wildlife Removal specialized in humane animal removal, exclusion, and property protection. Whatever your wildlife concerns may be, you can trust us to take care of it! 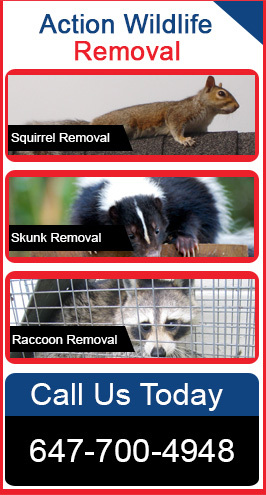 Call Action Wildlife Removal Orangeville to get a free quote on Wildlife Removal Services.